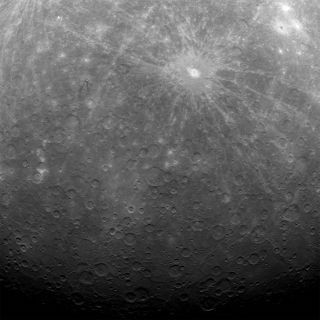 NASA's Mercury Messenger probe captured this historic image of Mercury, the first ever obtained from a spacecraft in orbit about the solar system's innermost planet. The photo was taken on Tuesday (March 29) at 5:20 am EDT. UPDATE: The latest photos of Mercury from NASA's Messenger spacecraft can be seen here. This story was updated at 5:32 p.m. ET. The first spacecraft ever to circle Mercury has beamed home the first-ever photo taken of the small rocky planet from orbit, showing a stark landscape peppered with craters. "This image is the first ever obtained from a spacecraft in orbit about the solar system's innermost planet," Messenger mission scientists explained in a statement. A smaller crater called Matabei, which is 15 miles (24 km) wide and is known for its "unusual dark rays," is also visible in the image to the west of the Debussy crater, mission managers explained. The new Mercury photo was posted to the Messenger mission website managed by the Johns Hopkins University Applied Physics Laboratory, which is overseeing the flight for NASA. The photo is the first of 363 snapshots Messenger took during six hours of observations around Mercury. The images are expected to cover previously unseen areas of Mercury, terrain that was missed by Messenger during three previous flybys before it entered orbit. Messenger arrived at Mercury on March 17, more than 6 1/2 years after its launch from Earth. The spacecraft paused in its Mercury photo reconnaissance work just long enough to beam the new images back to Earth, mission managers said. "The Messenger team is currently looking over the newly returned data, which are still continuing to come down," Messenger mission scientists said. NASA plans to hold a teleconference with reporters on Wednesday to review the latest Mercury discoveries by the Messenger probe. The spacecraft's name is short for the bulky moniker MErcury Surface, Space ENvironment, GEochemistry, and Ranging. The $446 million Messenger probe is expected to spend at least one Earth year studying Mercury from orbit. The spacecraft is in an extremely elliptical orbit that brings it within 124 miles (200 kilometers) of Mercury at the closest point and retreats to more than 9,300 miles (15,000 km) away at the farthest point. The primary science mission phase will begin on April 4, when Messenger will start mapping the entire surface of Mercury, a process that is expected to require around 75,000 images. Scientists hope the spacecraft will help answer longstanding mysteries over the planet's geology, formation and history. While Messenger is the first mission ever to orbit around Mercury, it is not the first spacecraft to visit the planet. NASA's Mariner 10 spacecraft flew by the planet three times in the mid-1970s.